I recently heard Noah Kagan talk about his Proactive Dashboard. It’s basically a way to track metrics on what you are actively doing, not the results of those actions. For example, you track how many blog posts you write each week, instead of how much traffic you get. Or you track how much time you spent coding, versus how many product sales you had. Too often I focus on lagging indicators like traffic and profit. These are important metrics, but they are a result of work I did in the past. They have little importance for my daily todo list. Traffic and profit are lagging indicators. Focus instead on things you can control. It’s sad to admit, but when my company has good sales I feel more “successful” than a day when I just grind out a bunch of tasks. This is focusing on the wrong thing. What is going to make me successful in the long run is creating a productivity system, and using that for my success metrics. If I create a good system and execute it, I have been successful. It may not get me more traffic or sales that day, but the system will work over time. Noah has an awesome system in his video that uses a Google Spreadsheet. I haven’t done that, but I recently signed up for Todoist to help me stay proactive. I created daily, weekly, and monthly tasks. I’m still refining it, but it’s helped me get better so far. 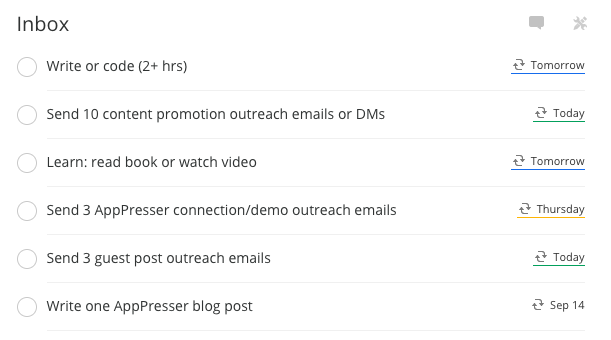 I have daily tasks like “write/code for 2 hours,” and weekly or monthly tasks like “Send 3 guest post outreach emails.” I only put the really important tasks in here, and it helps me make sure I get them done. By making my tasks specific and achievable, I make sure that I don’t get overwhelmed. Tim Ferris once said that his goal is to write 2 crappy pages per day. By making your goals easy enough to get started, you always end up doing more than you planned. The hardest part is just starting. The main point here is to focus on things you can control. You can’t control your traffic. You can’t control your revenue. You CAN control how much time you spend coding, or how many blog posts you write. Keep track of those metrics every day, and base your success on how well you execute your system. I’m curious to see what your thoughts are in one year on developing another product: Holler Box. I’m certainly not 2nd guessing you but what happens with AppPresser? Will sales keep going up? Is it possible to focus on two blogs at one time? Wishing for your success but curious how two products will affect the 1st. Hey Matt, my core focus is still on AppPresser. We have a great team in place and are constantly working to make the product better. We actually just brought on another full time developer to help in that respect, nothing but good things coming! I have to say I LOVE the Proactive Dashboard idea. Loved it the moment I saw it. And I’ve been using *many* different task and project management apps for years. This one feels like you can be on top of things in a much simpler way to focus on what needs to be done.